I would like to thank Jackie Mills & Roslyn Schwartz for organising the KJC Choir and Israeli Dance Group to perform on Sunday 10th September at The Garrison Family Funfest. They did 2 performances and both were very good. A big thank you to all dancers and singers. 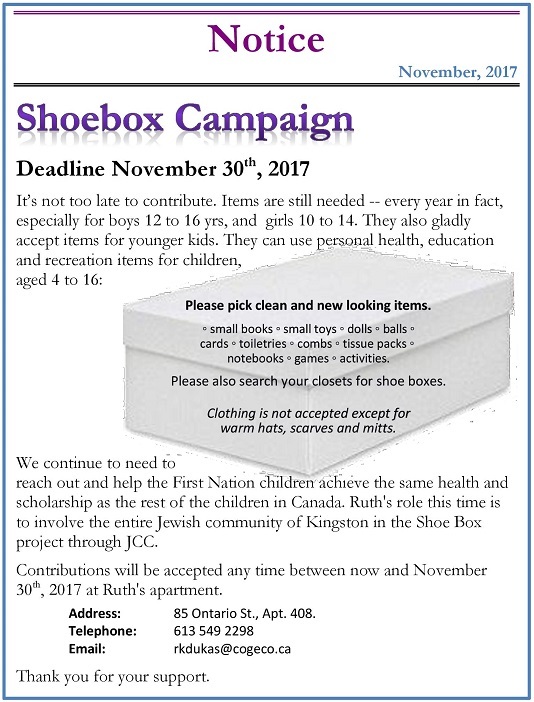 You will be receiving an email from the KJC Grow Kingston Committee with a link to a survey they have put together to look at where we are today, and what we need to move forward to ensure the Kingston Jewish Community is sustainable for another 100+ years and how it can attract new families to move to the community. Your input is crucial and in order to have a good sense of what the community needs are we need a large number of recipients. So, I am asking all of you to please take the 15 minutes to complete the survey online. 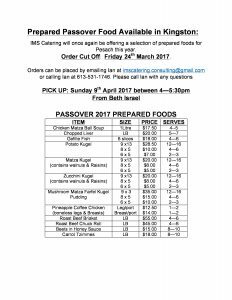 For anyone not comfortable doing it online, we will have copies available in self-addressed return envelopes at Kol Nidre Services. The higher the number of completed surveys we receive the more representative the results will be because any decisions coming out of this survey will be based on the opinions of most respondents. 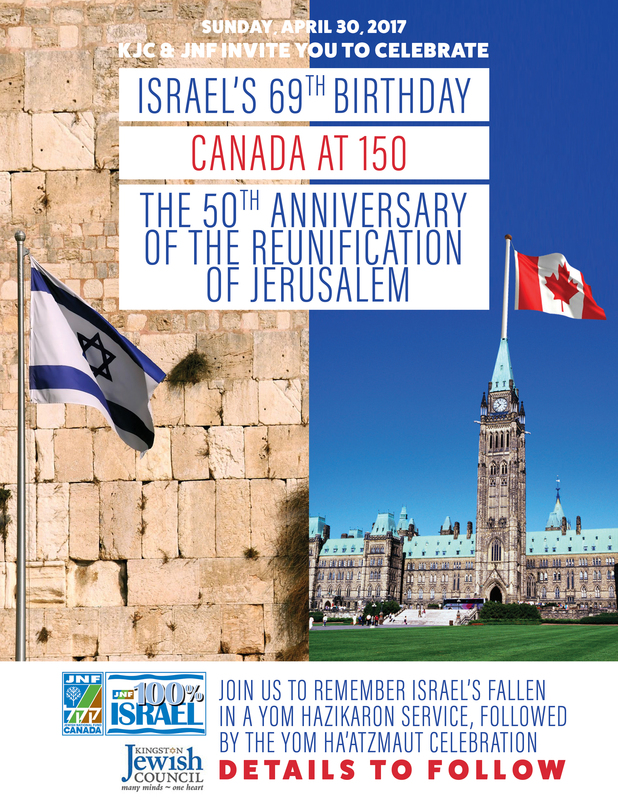 This year JFC-UIA is bringing in a dynamic speaker from Israel to tour Ontario and Kingston will be one of the tour stops during the JFC-UIA campaign season. 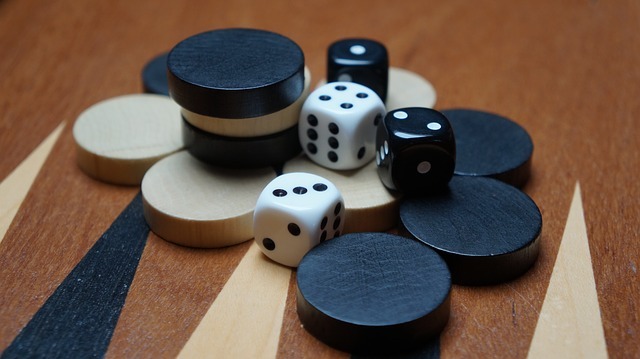 Zaki Djemal is based in Jerusalem, and along with friends created a Backgammon tournament to bring together Arabs and Jews and share common interests…backgammon aka Sheshbesh. 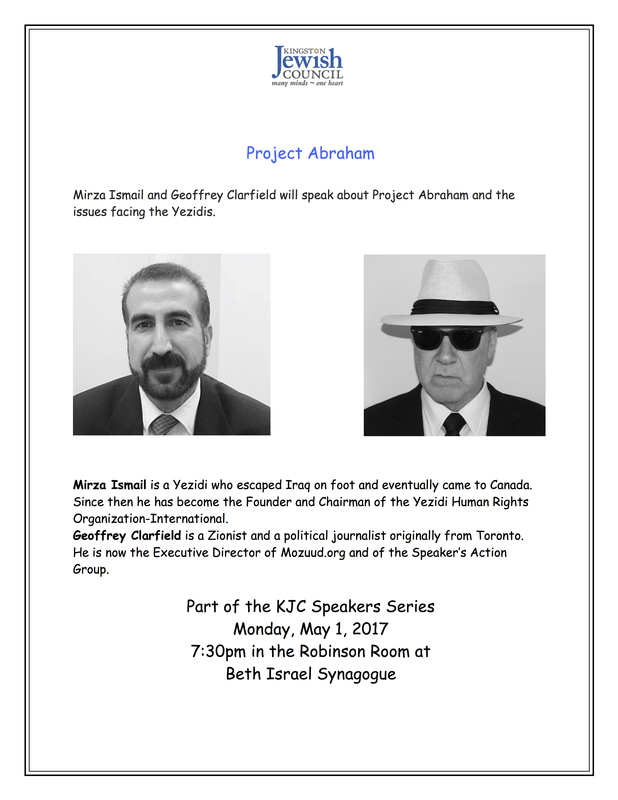 Zaki will speak in Kingston on Monday 16th October at 7:15pm at Beth Israel. 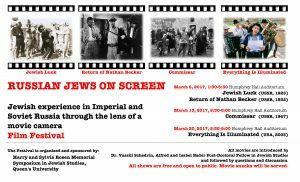 Dessert and coffee will be served and following Zaki’s talk those interested in playing some backgammon can do so (please bring your backgammon set with you). Flyer below. 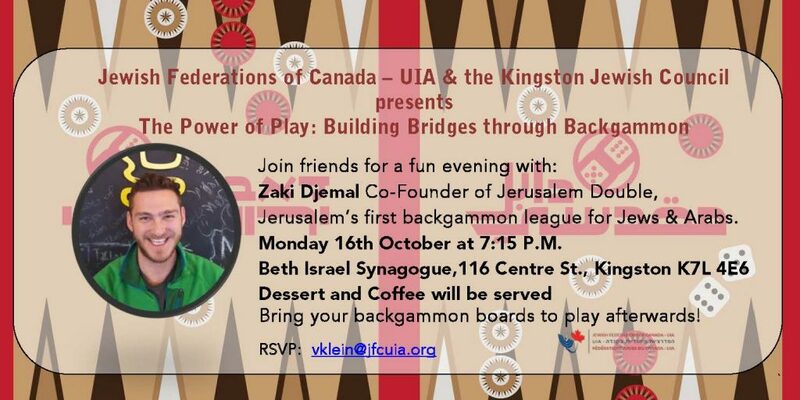 October 16 at 7:15pm – The Power of Play: Building Bridges Through Backgammon with Zaki Djemal. 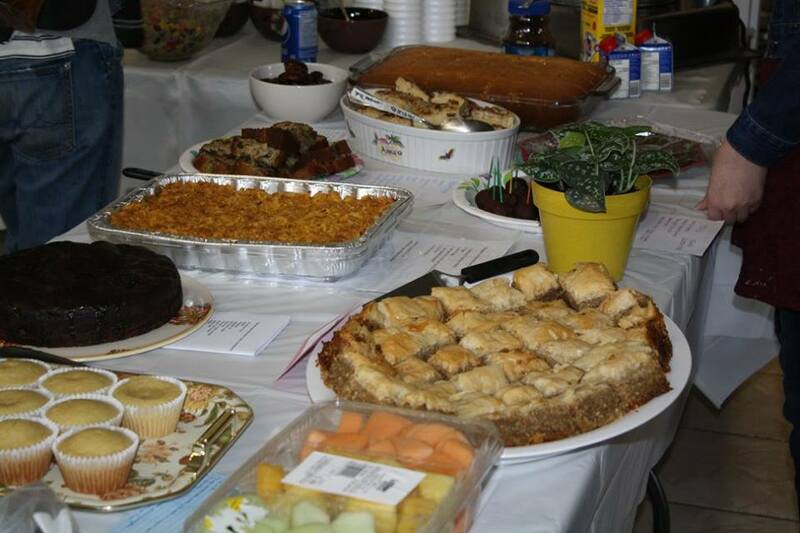 Dessert and coffee will be served, bring your backgammon board! 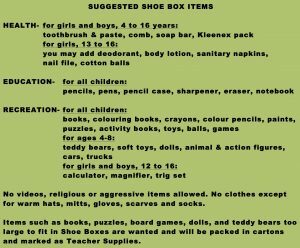 Each Shoe Box displays a label from the donor and an encouraging short message may be included. 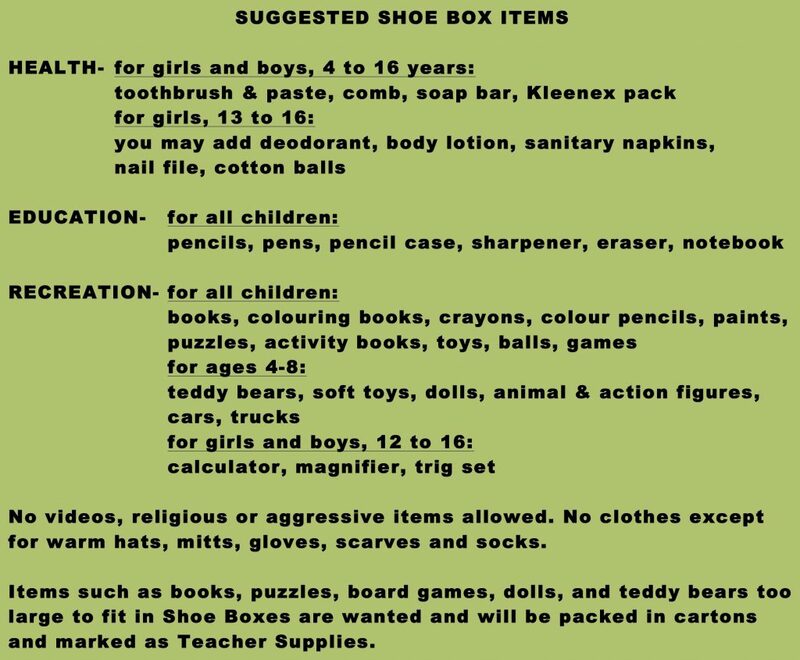 Each Shoe Box will have a label “ From the Kingston Jewish Council of Kingston, On.” attached to it. In June, the KJC honoured Ros Schwartz with the KJC Volunteer Award for her over 10 years work as director of the Kingston Jewish Community Choir. 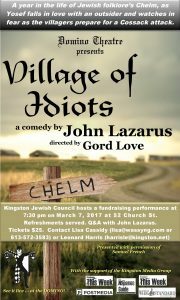 Years ago, Gini Rosen suggested that it would be a great idea if there were a Jewish choir in Kingston. Ros, who had been a founding member of the Open Voices Community Choir, volunteered to develop a local Jewish choir. She approached Valerie Fisher and Jane Enkin, and the three of them developed a Jewish choir which was attended by 15 to 20 people during the first few years. Valerie Fisher was the music director for about two years, and then Ros took over the musical leadership. 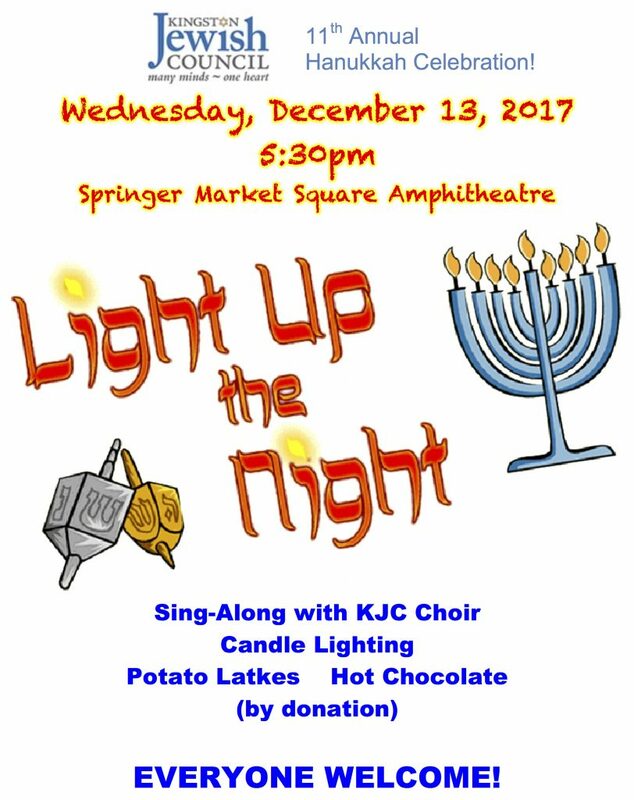 The choir has a loyal membership, and in addition to singing weekly, the choir leads community singing at Light Up The Night, Shabbat Shira, and other events. Ros is an inspirational indefatigable leader, who gifts our community with her talents, energy, enthusiasm, and love of music. 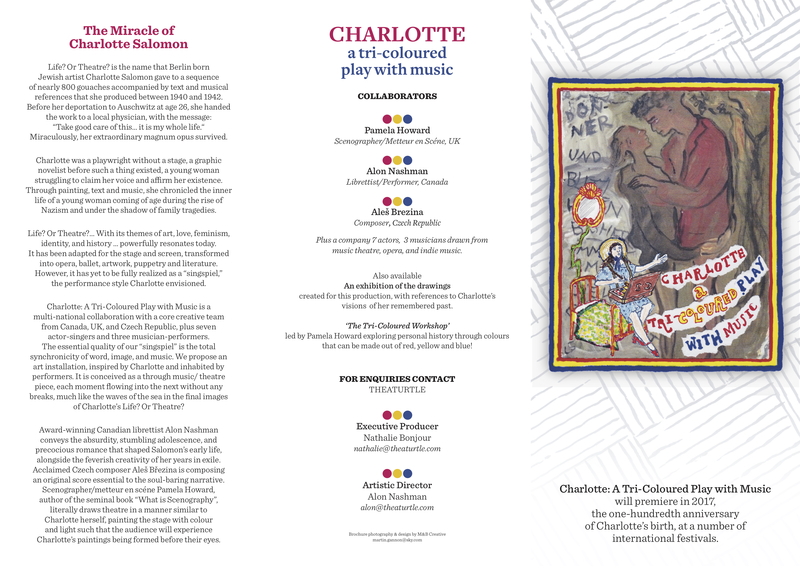 Ros imbues Jewish communal singing with joy and a sense of adventure. Students from Iyr Ha’Melech and Beth Israel came together on September 17 to make pickles. These pickles will be ready in a few weeks and will be available for sale as a fundraiser for the Foodbank. 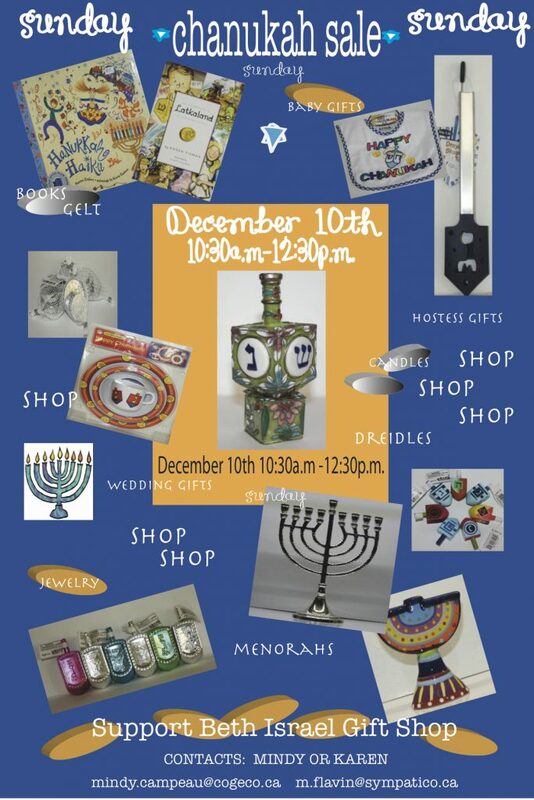 Please watch for more announcements when they are on sale and support the children in their Tzedakah project. In honour of Canada at 150, the Canadian Jewish Experience (CJE) is proud to come to historic Kingston where we pay tribute to Canada 150 with a nine-panel Exhibition showcasing 150 years of contributions by the Canadian Jewish community to Canadian society – from Human Rights and Architecture to Sports and the Arts. 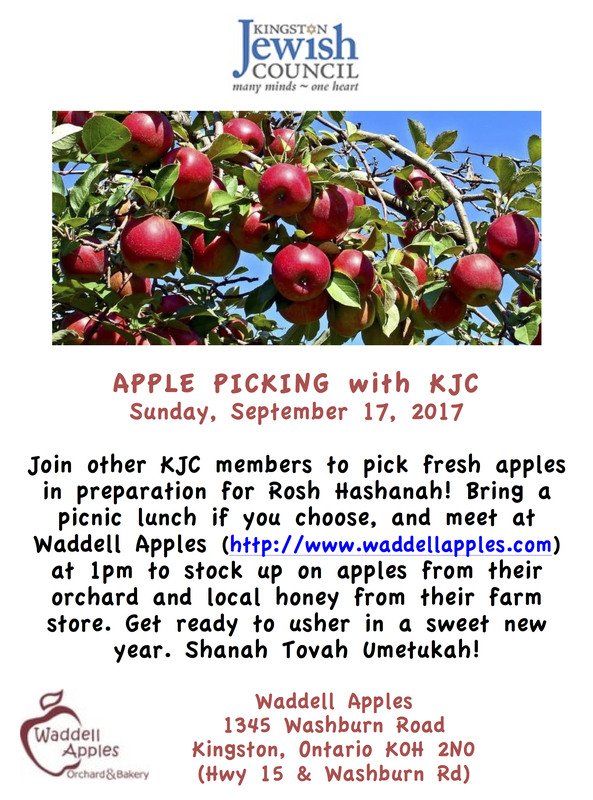 For further information, go to http://cje2017.com/ or contact locally Melissa Greenberg at melissa@mdg18.com . 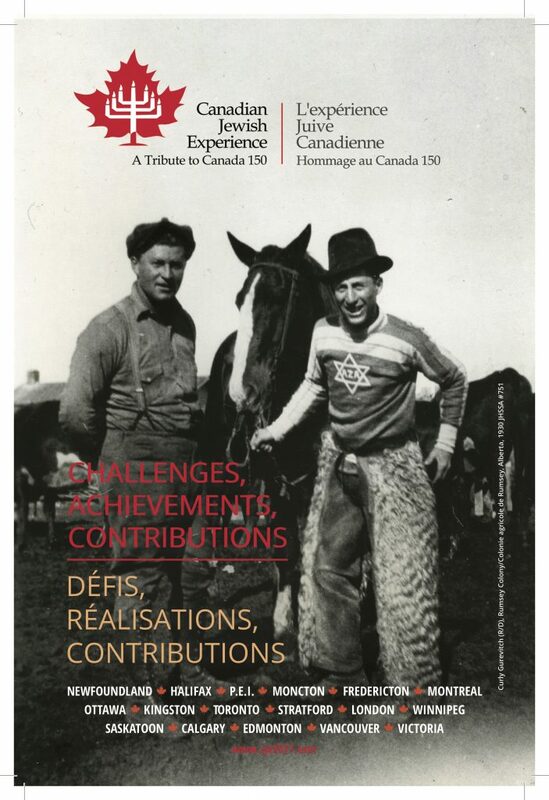 Check out the Canadian Jewish Experience Exhibition at Beth Israel during the High Holy Days / Yomtovim! 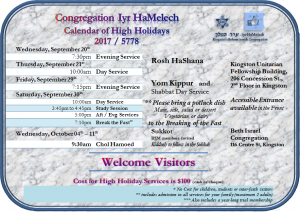 If you missed seeing it during Rosh Hashana, the Exhibition will remain at our synagogue until mid-October. Catch it while it’s here! 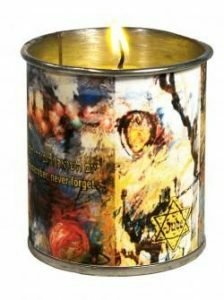 Thank you so much for your past support of JNF and the people of Israel. For this year’s high holiday yizkor campaign, JNF Canada is building a shelter for victims of domestic violence in Rishon LeZion, in partnership with the Israeli organization NO to Violence Against Women. It will provide safe housing and enable families to rebuild their lives and start over in the wake of shattering abuse. Please be generous. This project will have a life altering impact on women and children who desperately need this facility. Call 1-866-527-5516, ext 1, to make a donation or for more information. 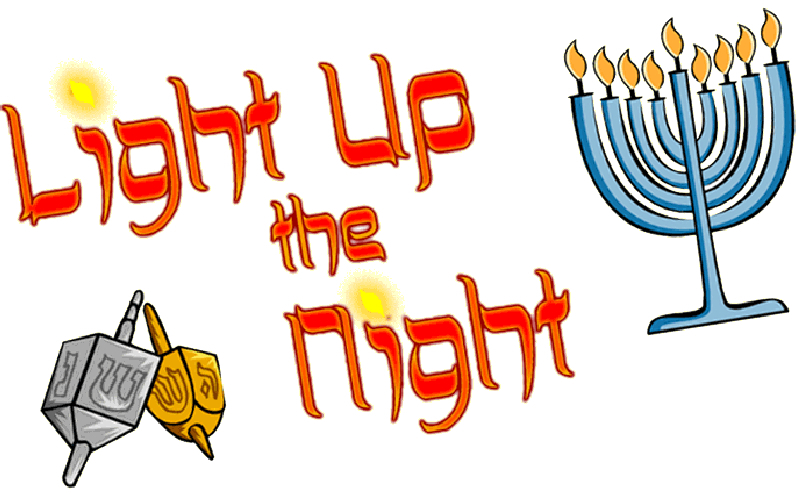 May the coming year bring peace to you, your family and the State of Israel. 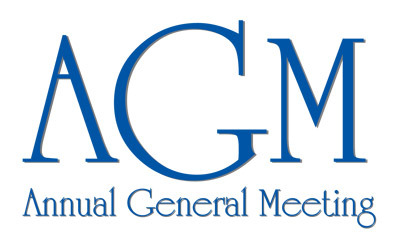 As I reflect on my first year as President of Kingston Jewish Council and look at what I set out to achieve in the year 5777 I am very pleased to say that the KJC Board and I have laid a solid foundation for the vision of reaching out to the larger Kingston Jewish community as well as the entire Kingston Community and are now actively engaged or looking at becoming engaged in many community events. 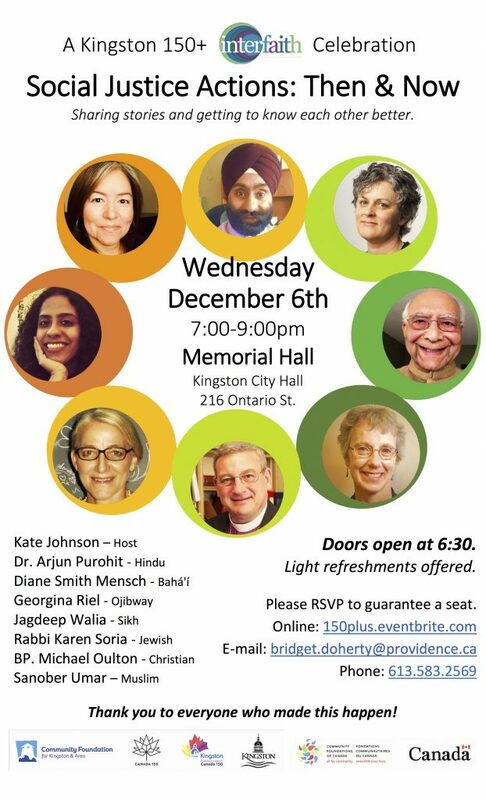 Over the past year I have developed a very good relationship with the City of Kingston and especially with the Mayor who I have had the opportunity to meet with on numerous occasions in an effort to become more visible and involved in making Kingston the diverse city it is. 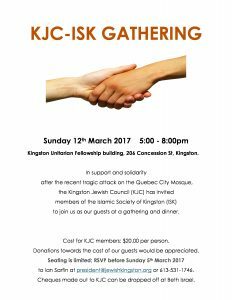 KJC is also getting more involved with some of the interfaith activities and groups in Kingston to help promote dialogue among the various religious groups in the city and this outreach will continue into 5778 and beyond. 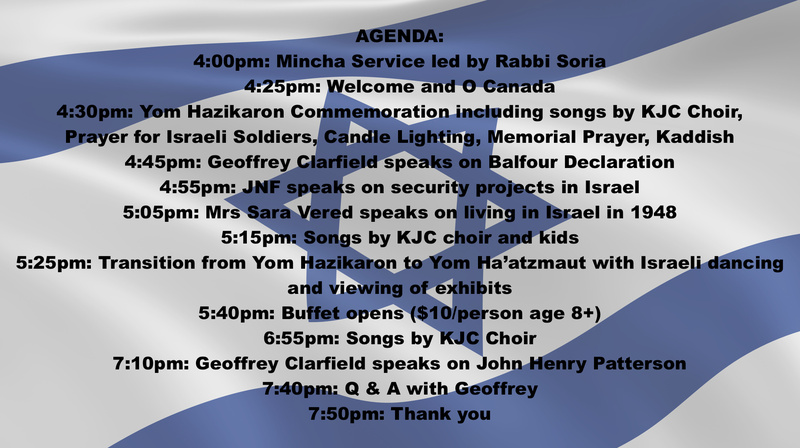 KJC receives funding from Jewish Federations Canada – United Israel Appeal to assist in providing the programing and events we do. 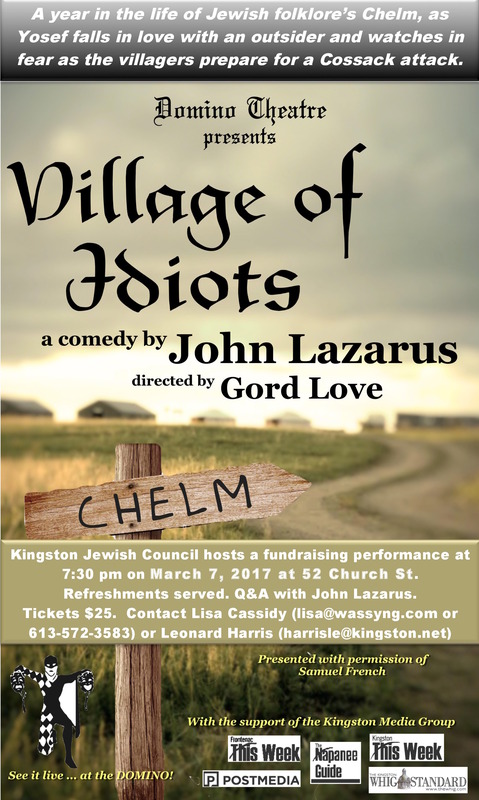 I am working on strengthening our relationship with JFC-UIA and reaching out to make use of the vast resources available to us in an attempt to offer more varied events and programs and to put Kingston on the Map as the centre of Jewish activity between Toronto, Ottawa & Montreal due to our great location. The key to us continuing to receive funding from JFC-UIA is the success of their annual and ongoing campaigns. So it is very important that the community continues to support them financially as without ongoing donations they cannot continue to fund KJC or the other worthwhile causes that they support. Just for clarification, funds collected by JFC-UIA are not only used to support Israel but are used locally to support the Jewish Federations across the country. 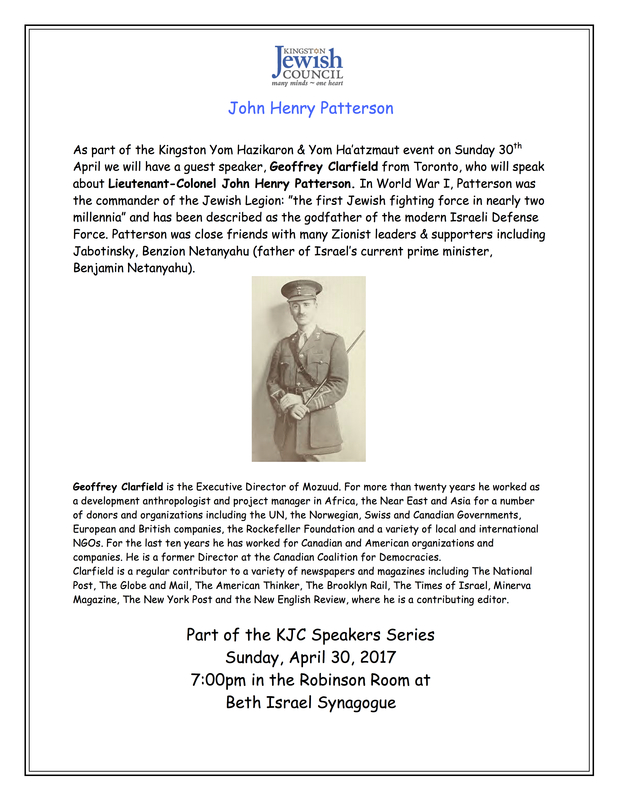 In the fall they will be kicking off their annual campaign and Kingston will be hosting a campaign event with a guest speaker (more details to follow). 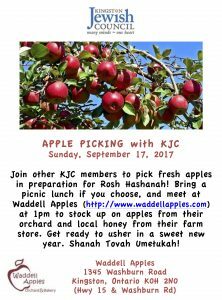 If you want more info on what JFC-UIA does, follow the link on our website at jewishkingston.org. www.canadiancolours.org. 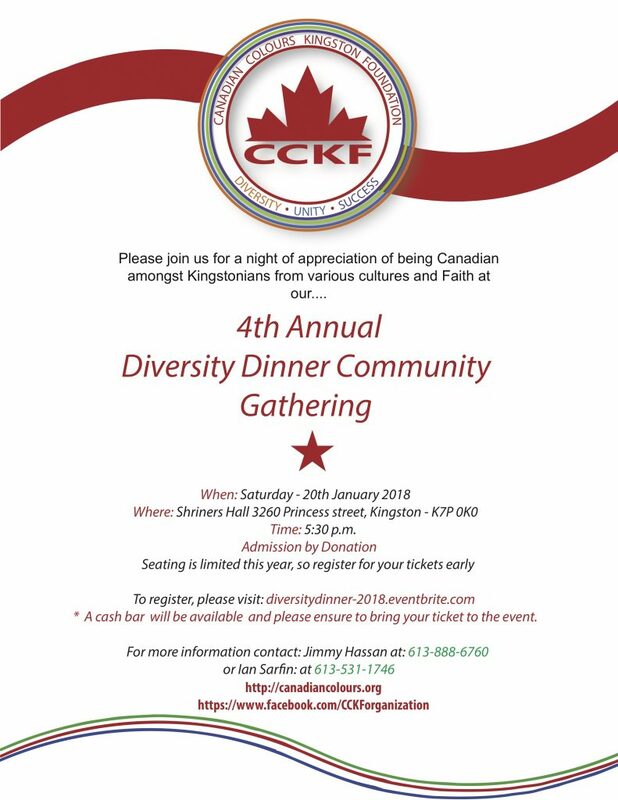 Their first major event will be the 4th Annual Diversity Dinner which will be held on Saturday 27th January 2018. On behalf of myself and the KJC Board of Directors, may the year 5778 be a year filled with peace, good health and happiness. 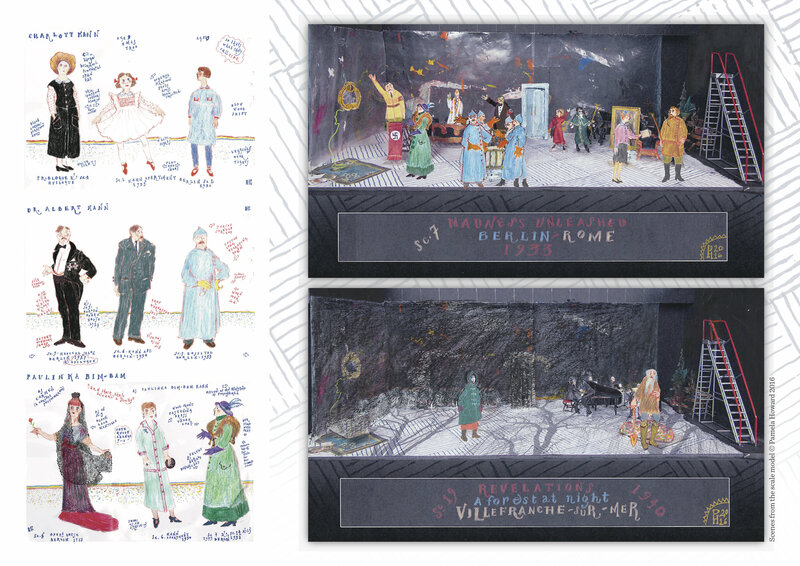 This year there will be two Irving and Regina Rosen Lectures. 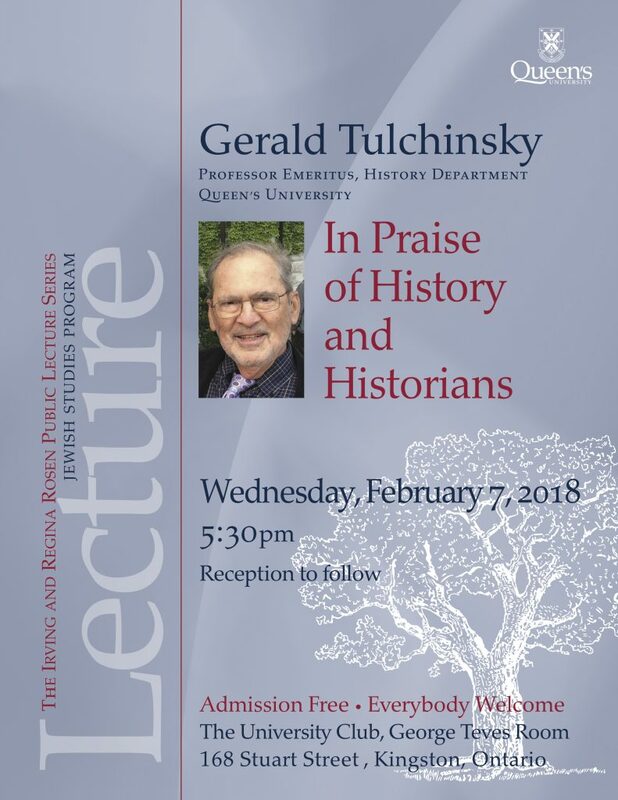 Professor Gerald Tulchinsky of Queen’s University will speak on the subject of “In Praise of History and Historians.” February 7, 2018, 5:30 pm. 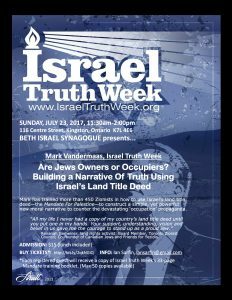 Gerald Tulchinsky is Professor Emeritus of History at Queen’s University, a leading historian of Canadian Jewish history, and former Director of the Program in Jewish Studies at Queen’s. Hello! My name is Dor Kwiatek, and I am the Israel Fellow for Queen’s Hillel this year. As an “Israel Fellow” my job is to strengthen the relationship between the local community and Israel through the students on campus. In Israel, I was working as a Tour Guide under the Ministry of Tourism. I also had a job at The Israel Nature and Parks Authority. I finished my BA at Kinneret College in the Jordan Valley studying “The Land of Israel studies”, which included different subjects such as; History, Archeology, Geology, Climate, Flora and Fauna and many more in relation to the Land of Israel. My Military service consisted of 6 years in regular service as an Officer in the Armored Corps, and almost 7 additional years as a Tank Company Commander in the reserves. I was born in Israel but I actually I grew up in Belgium from age 3-15. 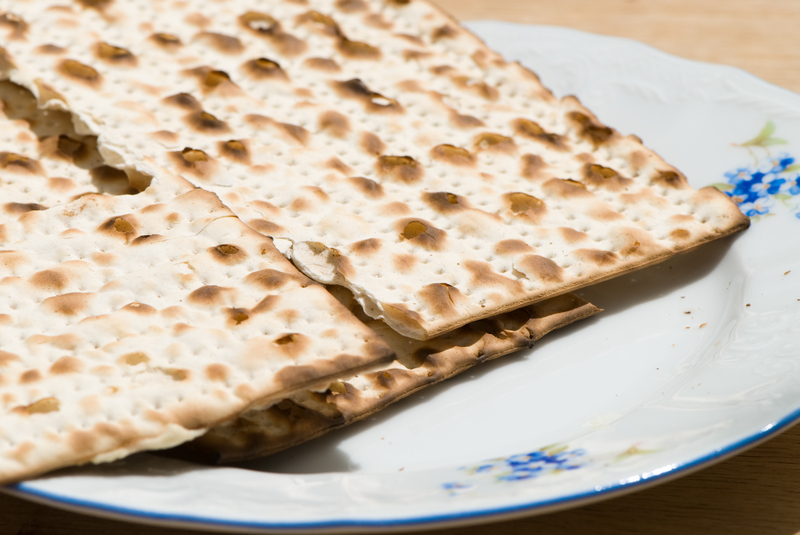 Which has given me the ability to know a bit about Jewish life outside of Israel. 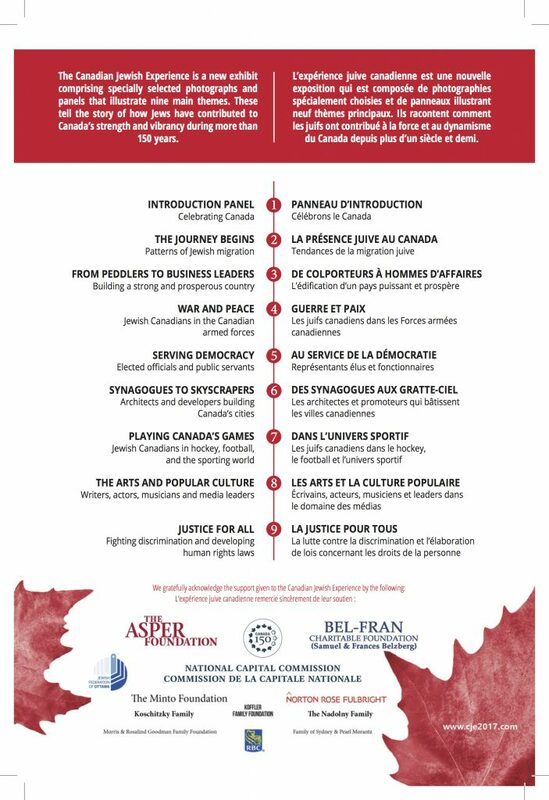 I’m looking forward to bringing my Israeli culture to Kingston, and to be able to learn about Canada so that I can bring my knowledge back to Israel! Hi Queen’s Hillel! My name is Ilana Shtivelman and I am extremely excited to join the Hillel family and serve as your Program Coordinator! I cannot wait to meet all of you, and delve into our Jewish journeys and experiences together! 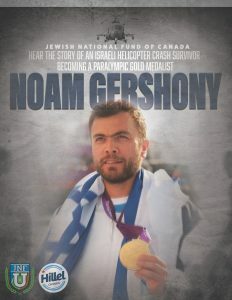 Before we all meet, here is a little bit about me: I was born and raised in Israel, and moved to Montreal when I was 8. Then at 15, I moved to the US, where I then went to Penn State University. There, I got my Bachelors in Spanish, French and Communications, and then got a Masters in International Affairs. This past year, I did a Masa program where I volunteered as an English teacher in an elementary school in Israel. In the past couple of years, I was very involved in my own Hillel at Penn State and in other Jewish organizations on campus. I interned in Jerusalem, and I served as a Resident Assistant for almost 3 years, as well. 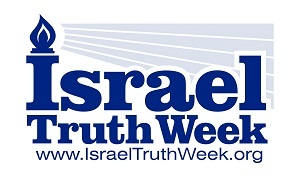 I am very interested in meeting and engaging people and helping them discover their Jewish identities and relationships with Israel, while continuing to do so myself. Good luck this year, I really look forward to meeting you, and I’m so excited for all of our upcoming adventures!! 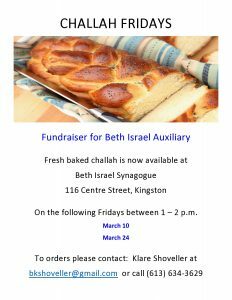 Whether you are a Jewish woman or a woman involved with a Jewish organization in Kingston ~ Save-the-Date! Rabbi Goldstein was the first female Reform Rabbi in Canada, and is currently the Rabbi of The City Shul in Toronto. Dr. Joseph is an Orthodox scholar at Concordia University in Montreal, and wife of the Rabbi Emeritus of the Sephardic Congregation. They are informed, provocative and up-to-date, and when they appear together on the dias they are doubly enjoyable. Lunch and Program is $25.00 per person, to be paid at the door. When invites go out RSVP’s will be accepted. 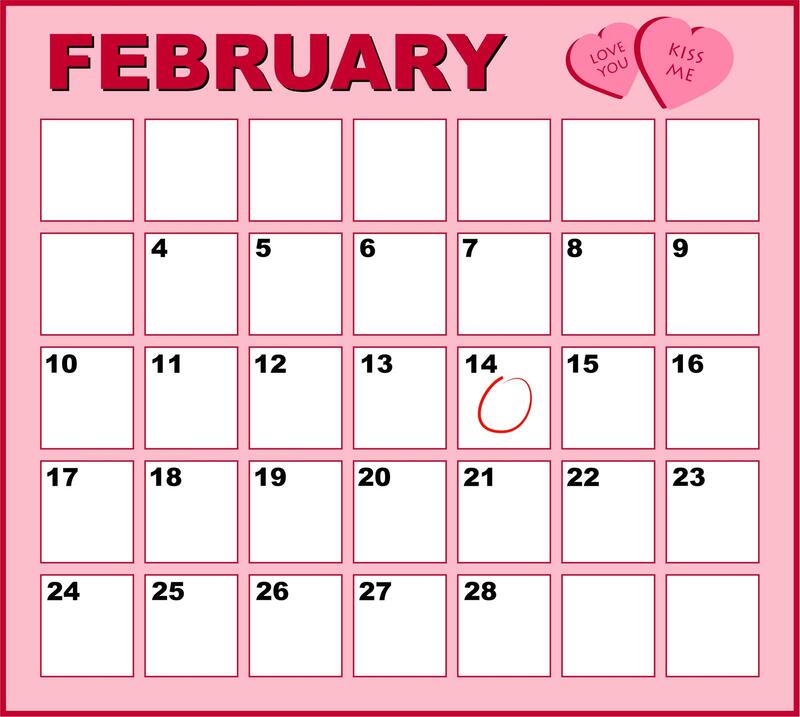 Put this on your calendar for a unique opportunity. 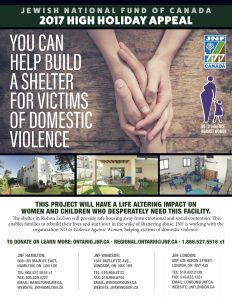 As part of your Jewish New Year, a time of renewal, reflection and mitzvot, please help JNF Canada offer women living with domestic violence a new shelter in Rishon LeZion. 60-75% of women living in abusive relationships have nowhere to go. 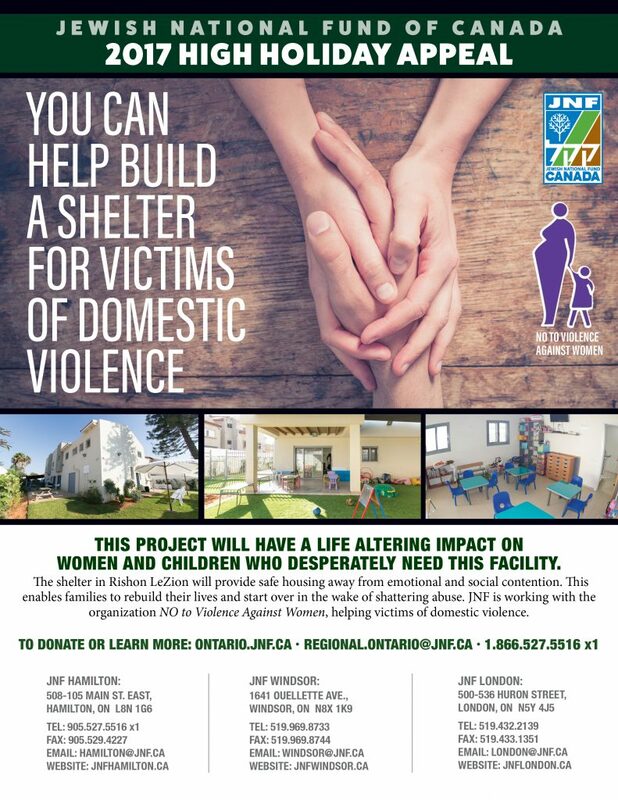 JNF Canada has partnered with No to Violence Against Women to build a new facility that will house 10-12 families desperately requiring a safe place to live. Please watch this heartfelt message from the women themselves, and please be part of the solution to help these families. 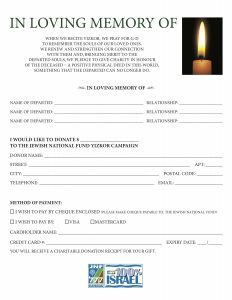 Remember that you can donate to the JNF all year round to special projects, tree plantings, commemoration books, and helping to better the lives for everyone living in Israel. From our family to yours, we wish you all a year of health, happiness and most of all, peace of mind. Marion was my friend, a Queen’s University colleague, and a fellow Kingston Jewish Community member for more than 40 years. She was a person of great energy and enthusiasm, had a good sense of humour, and was very friendly. For the past 4 years after we downsized and moved into our condo, she was also a neighbor. The night we moved into the building, Marion and Henry, both no longer in good health, insisted on making Bruce and I a lovely cold supper at the end of our long and tiring day to welcome us to our new home. This kind gesture exemplifies the thoughtful and generous family that they represented. They lived frugally, but were generous in their philanthropy and gave of themselves personally to their family, to this community, and the world at large. 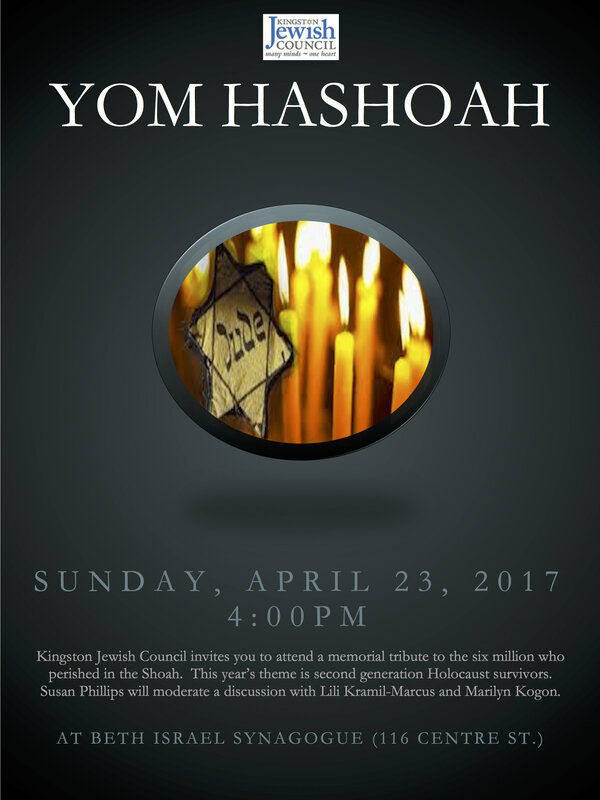 As you likely know, she was one of a small group of Holocaust survivors still living in Kingston in the 2nd decade of the 21st century. Marion was born in Berlin to a distinguished family. From the time she was a young girl, she demonstrated intelligence, gutsiness, maturity, and incredible bravery. She claimed that her older sister got the beauty and she inherited initiative & academic prowess. She had bravado too—at the age of 4 she recited her own poetry on Berlin radio, and was dubbing US and British films into German when she was 7 years old. But the family had to flee Berlin in 1934 after the Nazi’s came to power and moved to Paris. Before she was 10 years old, Marion was negotiating with French authorities to prevent deportation of the family back to Germany. Later, her family, along with many other Parisians, fled to the south of France after the German invasion of France in 1940. By the time she was in her late teens, Marion arranged for her mother’s protection by hiding her in a Catholic hospital as a patient when round ups of Jewish adults began. Later, when Marion with her sister and cousins fled across the French border to Switzerland, she was the group’s spokesperson arguing with Swiss authorities, not to return them to Nazi-occupied France. Marion’s strong beliefs about fighting oppression, poverty, discrimination, and genocide stayed with her to the very end. She worked tirelessly as a volunteer for Amnesty International, Save the Children, and other social justice groups. 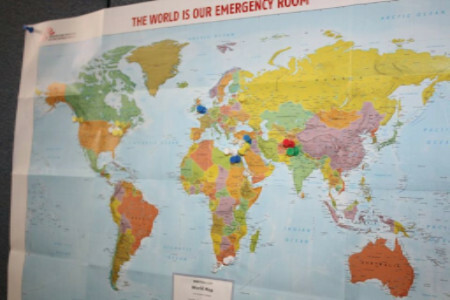 After Marion and Henry retired, they donated their time and expertise to a number of Third World Countries in Latin America and Africa through the auspices of CESO, Canadian Executive Services Overseas. 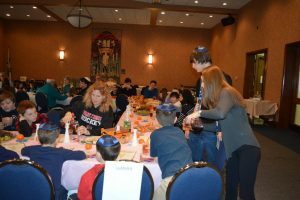 They shared deep friendships in Kingston especially in later years with several other couples in our Jewish community with whom they hosted rotating dinner parties. Marion was a Professor in the Sociology Department for four decades and was a respected teacher and scholar, and a role model for younger women academics. 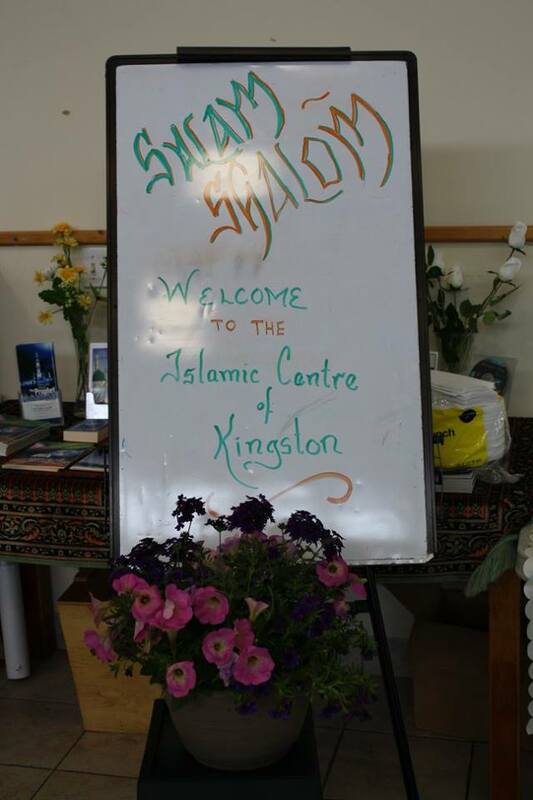 Marion is well known for her research about the Jewish Community in Kingston. She loved the stimulation of attending lectures, films, and discussions in which she participated. Marion’s family was the centre of her busy life: she and Henry had a supportive and loving relationship of mutual respect. 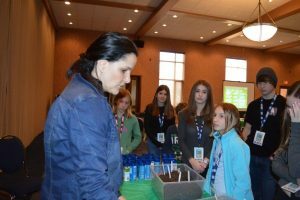 She took great pride in her efforts in raising her children, Winston, who is a banker and Michelle, who is a naturopathic doctor. As a family, they enjoyed camping, gardening and Marion loved to cook, bake, and knit for her family. Marion was happy when the children and grandchildren visited. Council and even took on the Presidency of the KJC as co-Presidents at one point when no one else came forward to provide this leadership. Marion was an active member of Iyr Ha Melech women’s book group and participated vigorously in our discussions. In our condo, she also attended the bridge club, as well the 8:30 am exercise group 3 times per week @ 8:30 am. The only thing I ever heard Marion complain about was missing Henry, especially after she would take one of her long daily walks and come home to an empty apartment. Although Henry had the foresight to arrange for regular caregivers after his passing, she still missed the companionship of her beloved husband, her best friend. Marion said she had had a tough early life but a wonderful later life which she shared with Henry. She will be missed by many. 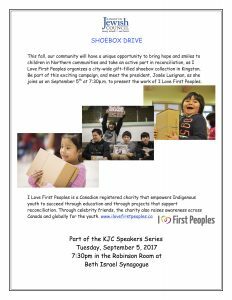 In November, there will be a city-wide campaign to fill Shoe Boxes for Indigenous Children of Northern Ontario. KJC, along with other ethnic, religious and community groups, has been asked to support and contribute ot the needs of these isolated and troubled children. KJC is proud to offer Israeli dancing lessons on Wednesday evenings from 7:00-8:00pm at Beth Israel (116 Centre St.) All ages and abilities are welcome to join these fun, relaxing lessons, taught by Jackie Mills. Jackie has over 30 years of experience teaching Israeli and International Folk Dance, with a focus on classic and children’s Israeli dance. Please email jrm@sitndance.ca to confirm class dates.